For Recital to run correctly on 64bit Linux you require the ia32 shared libraries. The 64bit port of Recital requires these libraries to allow access to 32bit Xbase and C-ISAM data files which are 32bit. If you do not have these libraries installed you will either get a "can't find db.exe" or an "error loading shared libraries" when trying to run or license Recital. Insert the Red Hat Enterprise Linux 5 Supplementary CD, which contains the ia32el package. Alternatively: Note you must have the required repo's enabled. In this article Barry Mavin, CEO and Chief Software Architect for Recital, details on how to use the Client Drivers provided with the Recital Database Server to work with local or remote server-side JDBC data sources. The Recital Universal .NET Data Provider provides connectivity to the Recital Database Server running on any supported platform (Windows, Linux, Unix, OpenVMS) using the RecitalConnection object. The Recital Universal JDBC Driver provides the same functionality for java applications. The Recital Universal ODBC Driver provides the same functionality for applications that use ODBC. Each of the above Client Drivers use a connection string to describe connections parameters. The basic format of a connection string consists of a series of keyword/value pairs separated by semicolons. The equals sign (=) connects each keyword and its value. The following table lists the valid names for keyword/values. The name or network address of the instance of the Recital Database Server which to connect to. Directory The target directory on the remote server where data to be accessed resides. This is ignored when a Database is specified. false When true, DES3 encryption is used for all data sent between the client and server. Database The name of the database on the remote server. Pwd The password used to authenticate access to the remote server. User ID The user name used to authenticate access to the remote server. false Enable connection pooling to the server. This provides for one connection to be shared. Rowid true When Rowid is true (the default) a column will be post-fixed to each SELECT query that is a unique row identifier. This is used to provide optimised UPDATE and DELETE operations. If you use the RecitalSqlGrid, RecitalSqlForm, or RecitalSqlGridForm components then this column is not visible but is used to handle updates to the underlying data source. Opens an SQL gateway(Connection) to a foreign SQL data source on the remote server. To connect to a server-side JDBC data source, you ue the gateway=value key/value pair in the following way. You can find examples of connection strings for most ODBC and OLE DB data sources by clicking here. // in a DataSet with the list of customers via the JDBC driver. // Database Server, and a gateway to the Recital Southwind database. // It then retrieves all the customers via the JDBC driver. SE Linux is a feature of the Linux kernel that provides mandatory access control. This policy based access control system grants far greater control over the resources on a machine than standard Linux access controls such as permissions. Many modern Linux distributions are shipping with SELinux enabled by default, Fedora 14 and Rhel 6 both install with it enabled. 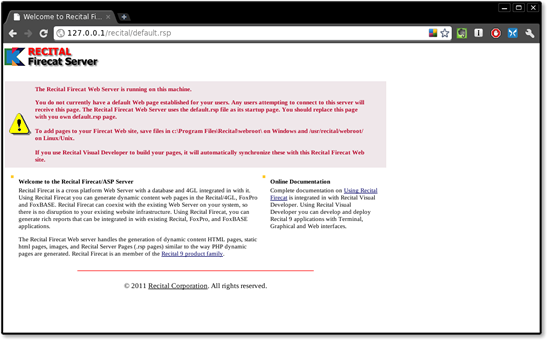 When you run Recital Web on a SELinux enabled machine and navigate to the default.rsp page you will see something similar to the screen shot below. If you launch the SELinux troubleshooter you will see the following problem. 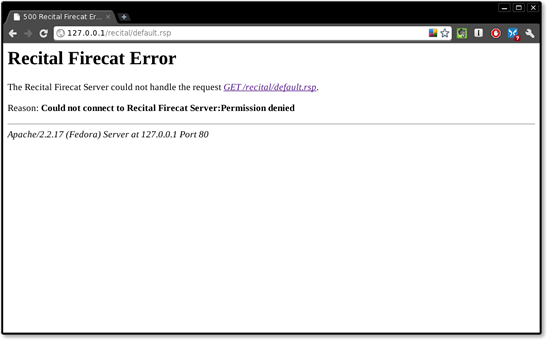 SELinux is blocking the apache server from accessing the Recital server running on port 8001. To manage you SELinux policy you must have the policycoreutils package group installed. The policycoreutils contains the policy core utilities that are required for basic operation of a SELinux system. If you wish to use a GUI tool, you must install the policycoreutils-gui package. We use the semanage command here to allow the http server access to port 8001. Once you have completed the steps detailed above you can go and navigate back to the default.rsp page in your borwser, where you will find the permission denied message is now replaced by the default.rsp page. SELinux does a great job of restricting services and daemons so rather than simply disabling it, why not work with it! The SET RELATION Recital Navigational Data Command can be used to link two (or more) tables based on the master index key of the child table. With a relation active, as you move through the parent table, the record pointer also moves in the child table, automatically selecting the first related record or moving to the end of file if no related record exists. The code above will display the productid from the first related record, but you will often want to display information from all the related records in the child or detail table as in an SQL Left Outer Join. Or we can use the SET SKIP command. The SET SKIP command can be used with DISPLAY, LIST and REPORT and automatically skips through all the related records in the child table. LIST and DISPLAY offer a number of keyword options to allow you to configure the display output. REPORT offers full column based report design. sernet.de maintain the latest Samba releases in a yum repository, allowing for an easy and painless install or upgrade of Samba on your yum based Linux distribution. Note: These steps will install the very latest build available at sernet.de. What are the key features of the Recital scripting language?